Scout Active Support became the new name for Scout Fellowship in September 2009. Essentially Active Support units are a group of adults who wish in some way to provide 'active support' to local Scouting. 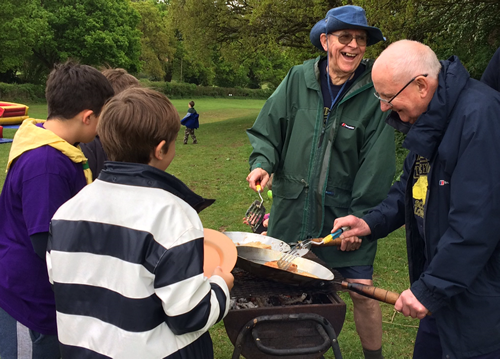 Active Support units can be made up of men and women of all ages, interests and backgrounds, whether or not they have been involved with Scouting or Guiding before. They can operate at local, national and international levels, but are most often connected to a District or County. All members of Scout Active Support are there because they wish to give some of their time to Scouting - this can be as much or as little as they like, in a wide variety of activities. Each unit also has their own social and activity programme. The aim of the Scout Active Support is to "Provide Active Support", with the emphasis being very much on practical support of the youth programme at all levels of the Association, from the local Scout Group to National level. Active Support units may be specialist groups, for example campsite service crews, activity teams, first aid teams or radio operators, or they may be a more general group of individuals with a variety of interests and skills who are ready to help out at all sorts of different events. Active Support units around the country regularly get involved in event organisation and support, adventurous activity provision, fundraising, supporting Section Leaders, providing social activities for Districts and Counties, skills based sessions and training. In fact, 'active support' can be just about anything, the list is endless. Many of the district Scouting activities in Redditch are supported, or indeed organised and run, by the Redditch Scout Active Support unit. Meetings are held on the third Thursday of each month in one of the local Scout huts. Remember, you don't need any special skills to make a significant contribution to Scouting in Redditch - a little time is the most precious thing you can give. Why not give it a try? If you are interested in joining Scout Active Support then visit the Scout Association's website to join the adventure.